TruckCraft’s D-ICER product line offers quick install 12-volt electric spreaders made entirely of aluminum and stainless steel to fit your application, from pickup truck dumpers to 19,500 pound capacity chassis one-tons with dumping capability. 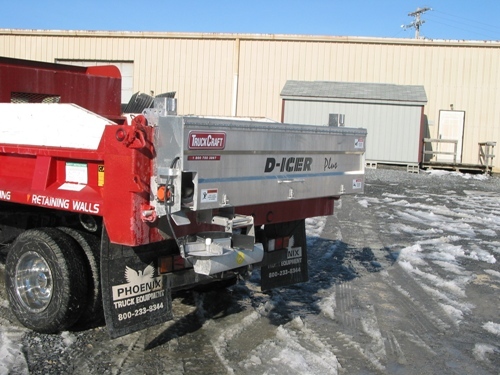 With no expensive clutch or PTO pumps to install, D-ICERs connect right to your truck battery with no modifications. All D-ICERs come complete with a heavy wiring harness, U.S.A. made in-cab digital control, all mounting hardware, backed by a two-year limited factory warranty. TruckCraft’s TC-131 D-ICER is a premier spreader made entirely of aluminum and stainless steel. 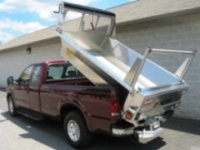 The system is designed to fit our TC-121 Ultra Aluminum Pickup Dump Inserts . The TC-131 is made of marine grade* aluminum and stainless steel, so is non-rusting and provides low maintenance and operational costs. *All aluminum used by TruckCraft is 6061 T6 or 5052- H32, classed as grade A or B by the Aluminum Association Standard. Grades A and B are recommended for use unprotected in industrial or seacoast structures. TruckCraft’s TC-140 D-ICER PLUS tailgate replacement spreader for one-tons requires no hydraulic system and is easy to install. TC-160 LIGHTNING 12V ELECTRIC UNDER TAILGATE SPREADER. All TruckCraft spreaders carry a two year limited factory warranty. Made of tough, corrosion resistant 6061 T6 Aluminum alloy and stainless steel you get the best of both worlds, weight savings and extreme durability in high-salt conditions. And check out innovative designs by TruckCraft, such as the completely enclosed 90 degree-angled gear reducer on the SPINNER DRIVE. It not only provides maximum road clearance by positioning the motor up, horizontally, but the 2:1 gear reduction doubles torque, allowing you to slow the spinner down without sacrificing torque. Heavy, factory assembled wiring harnesses carry power from the USA-made Electronic Control Unit to the enclosed,LEESON® Wash-Down-Grade motors, made with type 304 stainless shafts, double seals, epoxy coating, and sealed housings. It doesn’t get any beefier than this. See one at your local TruckCraft dealer now! Spreads free-flowing mat’l up to 3/4″ dia. 5751 Molly Pitcher Hwy. S.
Fill out our quick contact form for more information, or a personal contact.